MOC’s year at Zaccho. 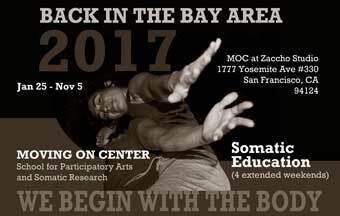 Somatic Education Module 2017 at Zaccho Studio in SF. The fist MOC module in Bay Area was offered in a four extended weekend format. Jan. 25, 2017 – Nov. 5, 2017. In Jan. 2017, Zaccho Studio (founded and directed by Joanna Haigood) brought MOC’s “Somatics Education Module” to their studio! MOC featured the “Somatics Education Module” in four extended weekend formats taught by master teachers in the field (the first module of the Full MOC Program). This module is a transformational, dynamic and rigorous movement based training offering a unique opportunity to integrate the desire for personal growth with the development of meaning professional skills, applicable to fields such as performing arts, education and health. The training gives you specific skills to develop your body connectivity, re-pattern habitual alignment and movement patterns and increase your kinesthetic awareness through embodied anatomy. ZACCHO Dance Studio, 1777 Yosemite Ave. #330, San Francisco, CA. 94124.